New data from the Pew Research Center shows religious violence is on the rise world-wide. Religiously motivated sectarian violence, harassment of women, mob-violence and terrorism have increased steadily and dramatically over the past 7 years in every region except the Americas. Still, many of these conflicts erupt in areas plagued by disputes over land and political control, so is religion really to blame? For this episode we review empirical research that attempts to understand the role religion and politics play in global religious conflicts. Also on this episode: What the hell is going on in Philosophy of Religion departments? While only 12% of philosophers accept or lean towards theism, 72% of philosophers who specialize in Philosophy of Religion are theists. Of course, both theists and atheists can find self-serving interpretations of this disconnect, but what is really going on? In trying to answer this question we examine research and educated opinions of those who work in the field. Uganda bill doesn’t get signed into law, but even the reasoning why is so bigoted it will make you furious. 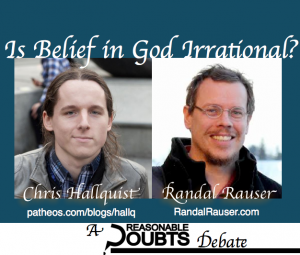 In late 2013, Chris Hallquist and Randal Rauser participated in a debate on the rationality of belief in God. This debate was not a live debate, rather it was a series of audio exchanges that took place in late 2013. The exchanges were according to agreed upon time limitations on each section. For each of their several sections, the debaters were given at least a week to analyze, script and record their entries before submitting it to their opponent. Each submission, has been edited together in the agreed upon order for your listening interest. As one speaker ends, the next will follow without interruption.